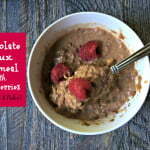 A delicious low carb and paleo substitute for oatmeal using chocolate and raspberries for added flavor. Eat either hot or cold or use to sprinkle on yogurt or pudding. Spread nuts and seeds (omitting cocoa and flaxseed) evenly on a dry cookie sheet. Pulse in a food processor until ground fine but with bits of nuts and seeds left. Add cocoa and flaxseed and mix well. Store in a container and keep on the counter. To make oatmeal take 1/4 cup mixture and 1/2 cup of milk of choice and microwave for 2 minutes. Add additional 1/4 cup of mixture and sweetener and mix well. Top with berries and enjoy. Note: You can use any type of seeds and nuts you have.